Working in a warehouse is not something to be taken lightly. It requires a lot of soft skills as well as physical strength. Warehouse workers also need to have good reflexes, especially when facing situations wherein their health or even their life is at risk. Working in a warehouse exposes the worker with a lot of risks that may endanger them if they are not careful. Resumes are documents used by job applicants to be submitted to companies who are in need of new employees. 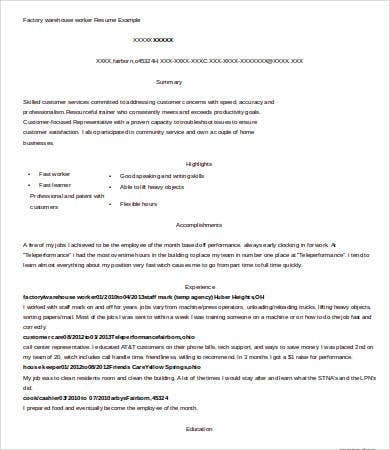 Resumes contain information regarding the applicant’s biographical background and the applicant’s contact details, educational attainment, skills, employment history for those who already have previous work experiences, and a list of people whom the company can contact to gather subjective feedback regarding the applicant. To help you get through the stress of writing resumes, we are providing you with Resume Template samples from our website. Entering a new job may be considered a risk to both the employer and the employee. It becomes a risk for the employer since they are not sure on what the newly hired employee is capable of doing, the latter being beneficial or detrimental to the company. On the other hand, it becomes a risk for the employee since they do not know the extent of the job assigned to them and the dangers that await them. 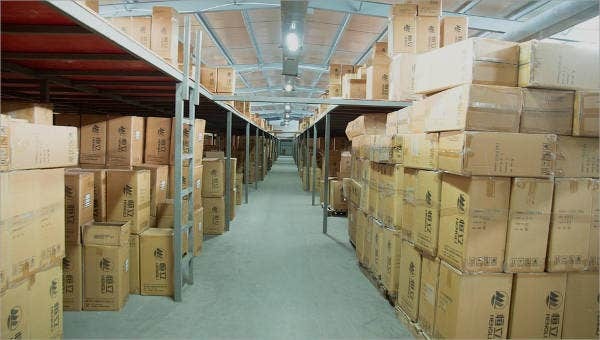 For warehouse workers, even though they are provided with safety gear and equipment, these are not sufficient to protect them from the hazards within the warehouse. 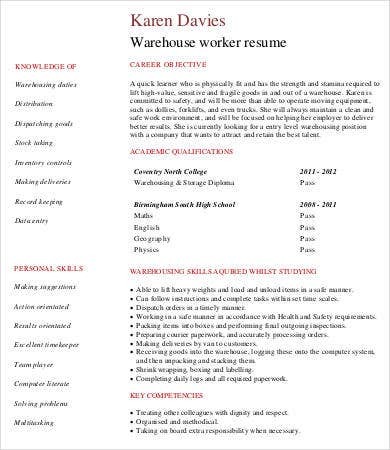 Just like any other job, applicants who wish to work in warehouses may be required to submit a cover letter and a resume. But how can we start composing our own resume if we don’t even know the types of resumes? Chronological. This type of resume is the most commonly used among the four. This resume puts emphasis on the previous work experience and lists them chronologically. Functional. This type of resume puts more emphasis on the applicant’s skills and abilities rather than the work experience. 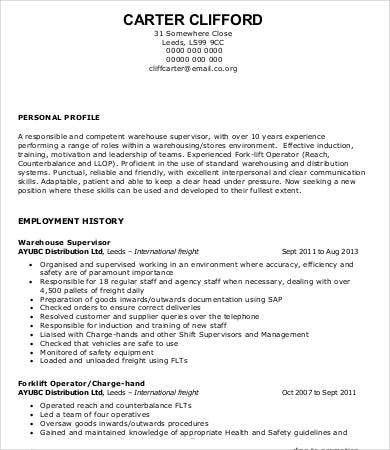 This resume is good for first-time applicants with no employment background. Combination. From the name itself, it combines the first two types of resumes and consists of two pages. The first page uses the chronological format while the second page uses the functional format. Targeted. A more complex type of resume wherein it is more personalized to suit what the company is looking for from an applicant. 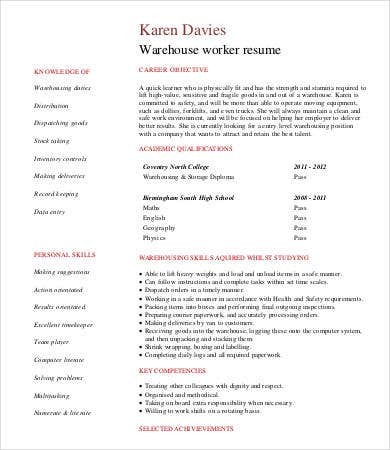 This resume may be time consuming to write and is not advisable when submitting to multiple employers, but this type of resume will usually stand out from among the rest. 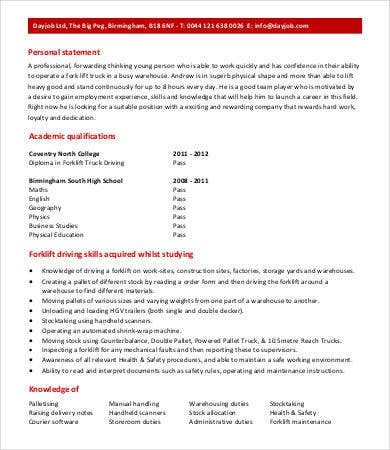 Also check out Volunteer Resume Template and Entry Level Resume Example from our websit for more sample templates. Now that you know the types of resumes and you can already determine which type is more appropriate for you, simply download your chosen template on your personal computer and you can start writing your own resume. We have saved you the hassle in writing your own resume from scratch by giving you a guide on what to write. 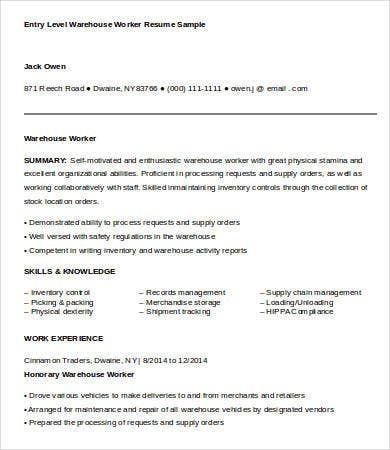 We have a wide range of resume templates for any warehouse job, and all you need to do is fill in the necessary details on the spaces provided. These templates come in PDF, Doc, or Docx format to suit your demands. These templates can be downloaded free of charge. So what are you waiting for? 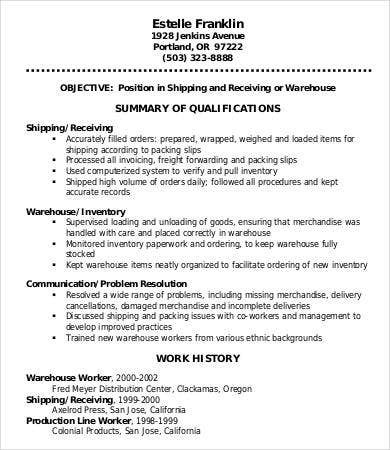 Write your own resume now and become a warehouse worker. 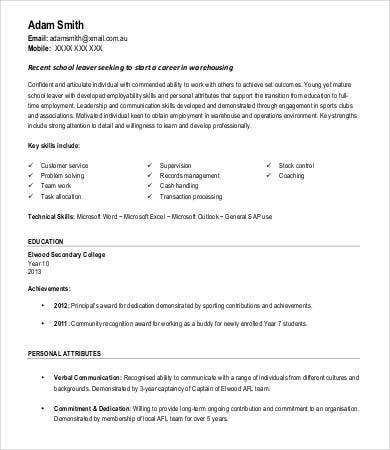 Also check out Work Resume Template from our website for even more sample templates.